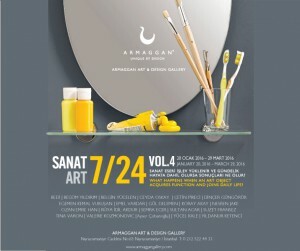 ARMAGGAN Art&Design Gallery is happy to inaugurate 2016 with Art 24/7 vol.4 the only functional art exhibition in Turkey. Organized for the first time in 2012, the exhibition had attracted attention owing to its name, content and artists in each series. 20 artists and their answers to the questions of; ‘’ How can art join the daily life and how can an artwork be a part of our 24/7 daily lives? ‘’ gather in Art ..